We’d love your help. Let us know what’s wrong with this preview of Short Story America Anthology, Volume 1 by T.D. Johnston. 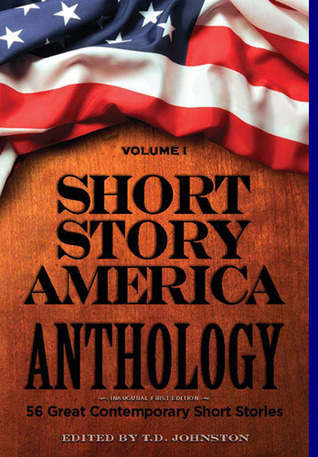 To ask other readers questions about Short Story America Anthology, Volume 1, please sign up. Short Story America has an interesting and successful model. They select one story each week to publish on their free web portal and then collect them annually into an anthology. After the first year in service, Editor in Chief Tim D. Johnston has released 56 stories in this first volume. At one time, the short story was a staple of American entertainment. Such stories appeared regularly in magazines and newspapers. People read short stories like they now watch television. Recent decades have br Short Story America has an interesting and successful model. They select one story each week to publish on their free web portal and then collect them annually into an anthology. After the first year in service, Editor in Chief Tim D. Johnston has released 56 stories in this first volume. At one time, the short story was a staple of American entertainment. Such stories appeared regularly in magazines and newspapers. People read short stories like they now watch television. Recent decades have brought a near death of the short form as a story telling device. Fortunately the last few years have signaled a stirring of life once again in short fiction. Short Story America is an excellent example of this renaissance. The short story requires an economy of words that forces a writer to sharpen her skills in balancing the right mixture of description and prose. Many novelists who have never written in this form are tempted to fall in love with their own words and ramble on endlessly trying to fill up pages and often losing the point in the process. Summing up this thought; the short story forces a writer to refine his story telling skills. This anthology is a great example of some of the finest modern story telling from today's emerging new voices. Each story a bite sized portion allowing you to reach a conclusion in one sitting rather than leaving you hanging for the next 400 pages the way a novel does. I love novels, but short stories should not be overlooked. Whereas a novel is theater of the mind, sweeping by on the big screen providing hours of entertainment growing and forming over long periods; the short story is like theater of the mind on the small screen giving you a satisfying resolution in short order. This volume of the Short Story America Anthology provides 56 such intellectual meals for the reader. I have to admit that I'm a little biased. My story is included. That connection aside, the stories are wonderful. It's the kind of collection that I like to keep on my night stand for those nights when I need a good read before I go to sleep. This major collection is available in hardcover, signed first edition, at www.shortstoryamerica.com.